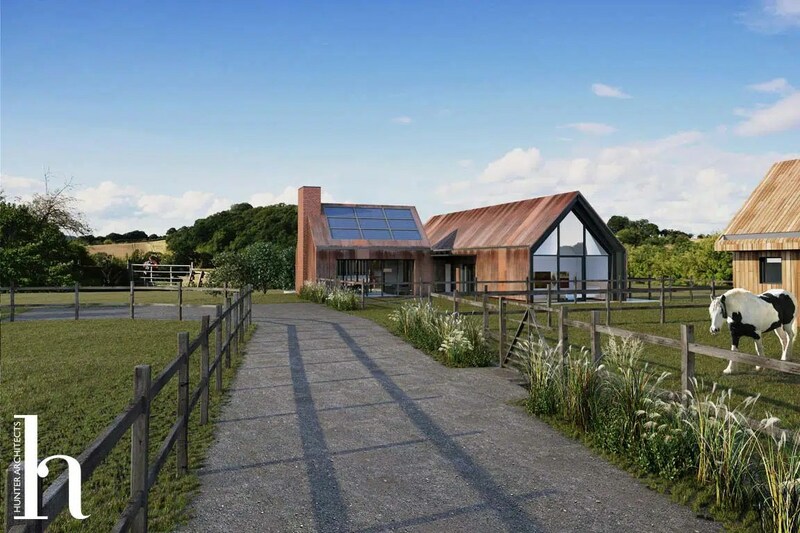 Contemporary contextual Eco family house and Stables Outbuildings in the Malvern Hills - Self Build Architects. The form of the dwelling was influenced by the nature of the simple forms and massings of the area as well as the traditional stables blocks which are also incorporated into the site. The initial concept sketches sought to create a courtyard feel with a central private amenity space. The designs evolved into, effectively a courtyard arrangement with two L-shaped sections, the first being the dwelling and the second being the stables. The L-shape of the dwelling had the benefit of reducing circulation space, overlooking within the dwelling and making the most of the southerly orientation and views across the stables as well as views down the slope and across the open countryside. The stables block has been designed with specific reference to the existing horses on site as well as reflecting but being simpler than the main dwelling house. There is an external yard and informal grazing space for the horses linked to the main house. The main amenity space, grazing and exercise space remains as existing which is the substantial lower sections of the site. The horses will access this lower section in the same way as they do now, via the path to the side of the existing barn. The dwelling and elevations have been designed with this in mind, with the materials and details being developed accordingly. Internally, the dwelling has been orientated with the main living spaces benefitting from being south facing although generally run in parallel to the side boundary and retain a view over the hills to the north. The ancillary spaces, such as the servicing spaces are located on the outer line of the dwelling views across the site. The open plan living wing is orientated angled at more than ninety degrees to the main part of the house so that the bedroom spaces retain privacy from the main living spaces, while giving access to the external spaces as well. The Master Bedroom suite is located at the end of the bedroom wing, which provides the most privacy from the living spaces, but also provides a better vista over the external spaces and importantly having direct visual contact with the horses in the stables. 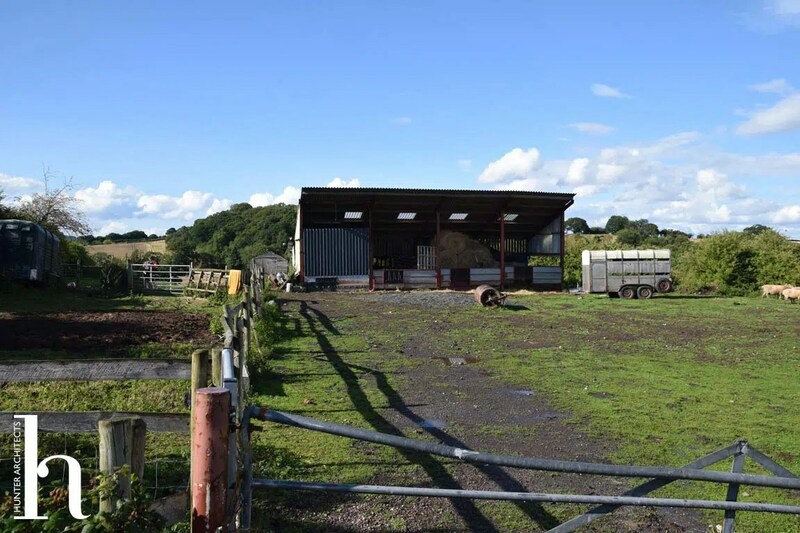 Features: open countryside, carbon neutral, retired home, stables, outbuildings, contemporary.